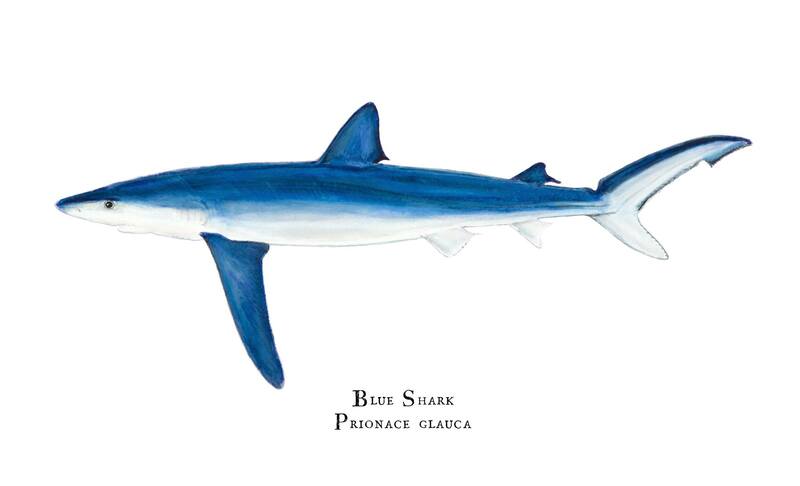 The blue shark (Prionace glauca), along with the spiny dogfish (Squalus acanthias) is one of the most common sharks observed in the Gulf of Maine. Reaching a maximum size of 400 cm and potentially weighing more than 205 kg, the blue shark is unusual amongst sharks insofar as its reproductive capacity is concerned. Unlike most sharks, the blue shark grows relatively quickly and reaches sexual maturity in as little as four years. Female blue sharks produce litters of up to 80 pups, although more commonly litters are less than 40. Still, when compared with the extremely small litter size of most sharks, blue sharks have a significant advantage. Blue sharks reproductive capacity is one of the reasons that it is not listed as Vulnerable or Endangered on the IUCN Red List like most shark species documented in the Gulf of Maine. Despite an estimated 10-20 million blue sharks taken annually in fisheries worldwide, there are few data suggesting significant population declines. Nonetheless, marine scientists are concerned about the effects of removing such a large number of apex predators from any marine ecosystem, especially given how important keystone predators are known to be in terms of ocean health. While there is a recreational fishery for Blue sharks, most that are harvested commercially are bycatch. The blue shark is currently listed as "Near Threatened" on the IUCN Red List. The blue shark is considered abundant in much of its range, which includes both temperate and tropical waters. In fact, the blue shark is one of the most wide-ranging sharks. It typically feeds on smaller fishes such as herring, silver hake, white hake, red hake, cod, haddock, pollock, mackerel, butterfish, sea raven and flounder. Known predators include the California sea lion (Zalophus californianus) and larger sharks such as the shortfin mako (Isurus oxyrinchus) and the white shark (Carcharodon carcharias), both of which also are documented in the Gulf of Maine. While the blue shark is not considered an overly aggressive shark, there are documented cases of blue sharks attacking humans. The International Shark Attack File lists 13 confirmed unprovoked attacks around the world between 1580 and 2014. 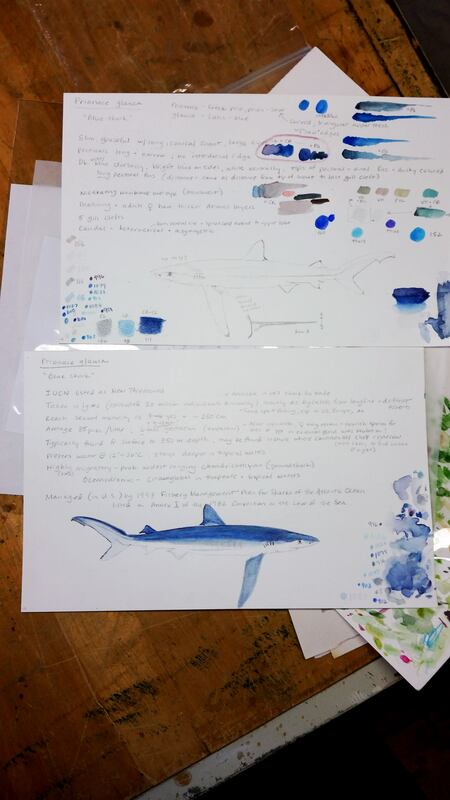 Purchase an open edition print of my scientific illustration of a blue shark today, and choose any other open edition print for free! Simply mention this offer in the comments field when checking out, and let me know which open edition print you would like me to include with your order for free!